For the past week, anyone who walks in the door here at Earthy Delights is immediately greeted by the heady aroma of fresh, just-picked ramps. Ramps (or wild leeks, as they are also known) are a true harbinger of spring – often the first edible plant in the wild forager’s harvest. Many years (including this year), wild ramp shoots can be found poking up through the last crust of winter’s melting snow. Right now, it’s early spring ramps from West Virginia, but the first of own Michigan wild leeks are already on the way. These slender ramps have a sweet, but spicy bite and amazing flavor. About the size of a green onion or scallion, these early ramps are a real taste treat. Once cleaned of their root and “button”, the entire ramp is edible, sliced raw into salads or cooked in any way you can imagine. 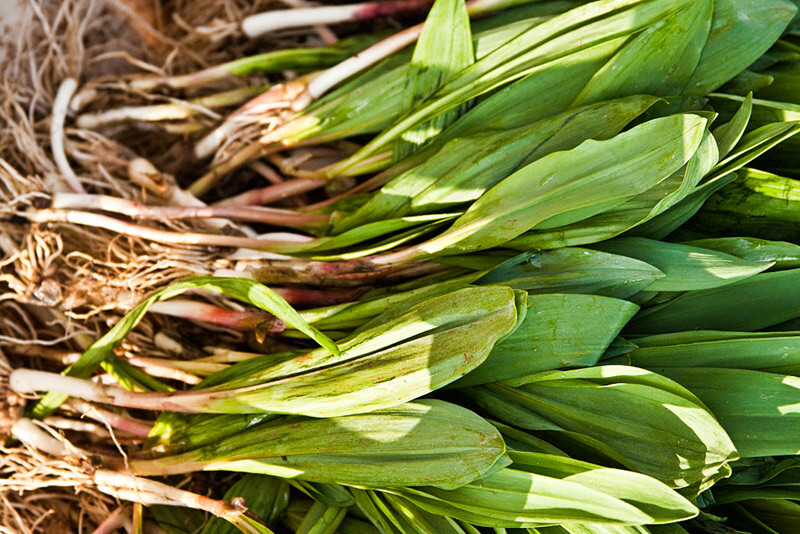 Ramps or Wild Leeks: What’s the difference? Ramps and wild leeks are the same plant (Allium tricoccum), a wild-growing member of the onion family (Alliaceae), generally seen with the edible small white bulb and the broad green leaves attached. Found as far south as Georgia and north to Canada, they’re especially popular in the folk cuisine of the Appalachian mountains when they first emerge early in the spring. Ramps have a spicy exciting flavor, like a combination of onions and garlic. They make a bold statement on salads, in soups or sauces or whole as a garnish. 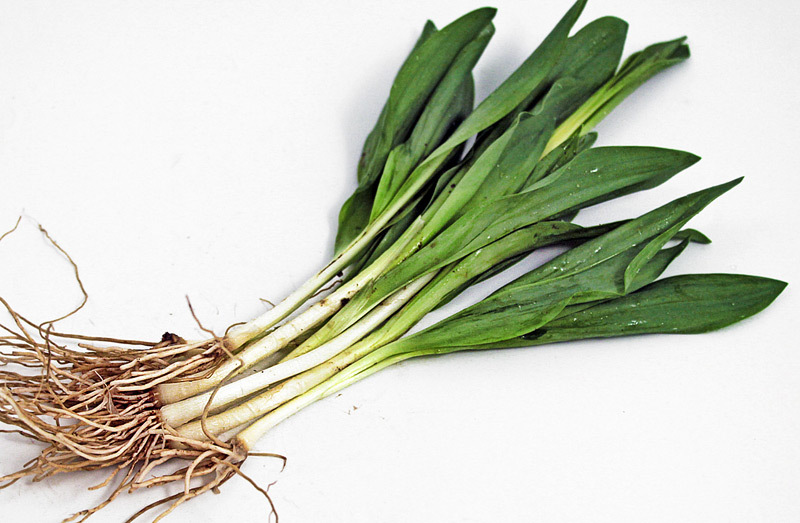 The names “Ramps” and “Wild Leeks” are differentiated primarily by their different growing regions. 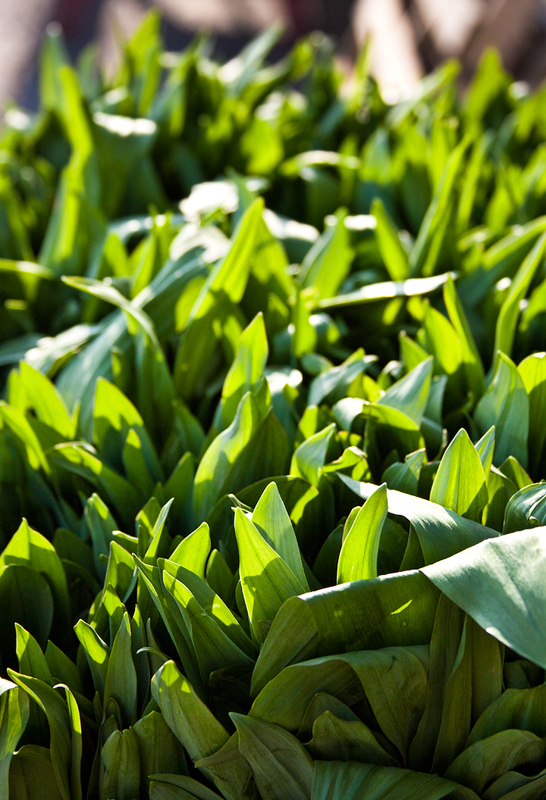 Where they are found growing in the south, they are known as ramps. Harvest in this region typically begins around the middle of March. 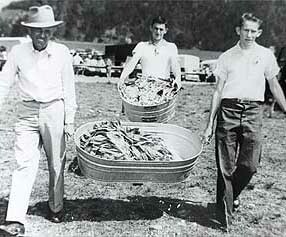 A few weeks later, the harvest begins in the Great Lakes region where they are called wild leeks. Northern wild leeks tend to have a larger bulb and a slightly milder flavor than their southern cousins. Wild leeks deepen and mature their incredible flavor to perfection. But… while the taste is much the same, somehow in the north wild leeks never stir up quite the fuss that southern ramps seem to. The European settlers of Appalachia first learned about local wild foods from the Cherokee Indians. The Cherokee considered this early wild onion a tonic and believed them to possess special vitamins, minerals and restorative powers. Ramps still grow prolifically in the traditional Cherokee heartland and gathering ramps in spring is still a ritual among the surviving Eastern Cherokee. The early English settlers, well acquainted with a different, but similar European wild onion known as the “ramson” (Allium ursinum), called this new food by the familiar name from home. 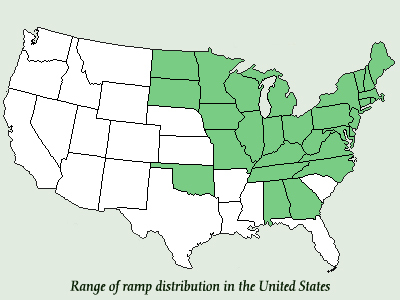 Over time, the word “ramp” evolved – a term with deep roots in the Old World (Middle English ramsyn from Old English hramsan, “wild garlic”). Ramps have been relished for springtime dining since early the early pioneer days and were the centerpiece for many a springtime “supper” in early frontier settlements. Believing the ramp to possess the revitalizing power of a spring tonic, the mountain folks looked forward to the return of the ramp after a winter of eating mostly preserved foods. Elders still proclaim that “they’re good for what ails you!”. Today, wherever ramps grow, they continue to be the healer, solace and friend to mountain folk. The name of the U.S. city Chicago originates from “Checagou” (Chick-Ah-Goo-Ah), which in the Potawatomi language means “wild onions”. The area was so named because of the smell of rotting marshland wild leeks (ramps) that used to cover it. 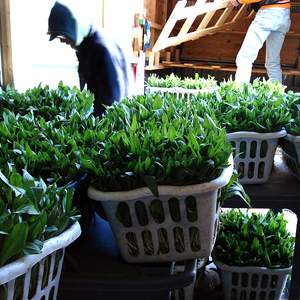 In central Appalachia, ramps have achieved a near-mythic status. In the hill country of Tennessee and Kentucky festivals celebrating this wilding’s birth with food, music and dance sprout up each spring. Whole towns get together and stew up a mess of ramps. Some of these ‘ramp feeds’ (as they are known) draw hundreds of ramp lovers from considerable distances to sample foods featuring the odoriferous plant. Ramps are often fried with “taters” in bacon grease or scrambled with eggs and are usually served with bacon, beans and cornbread. Community festivals were not commonplace in 1954 when the Cosby Ruritan Club of Cocke County, Tennessee first established a celebration centered around the Appalachian spring staple. The resulting two-day festival honored “the sweetest tasting and vilest smelling vegetable in Mother Nature’s bounty.” The first Festival attracted a crowd of between 5,000 and 6,000, including the Tennessee governor. Although the festival differs from year to year, there have always been common threads: bountiful food, music, dancing, politicians, and a young woman who is crowned “Maid of Ramps.” Want to learn more about local ramp festivals? Check out the Earthy Delights Ramp Links. Ramps Are Good for You! They’ve traditionally been considered to be a powerful folk medicine said to keep away cold, flu – and the neighbors! The reputation which holds both ramps and wild leeks to be powerful healers turns out to be well deserved. They are high in Vitamins C and A, and are full of healthful minerals. And they have the same cholesterol-reducing capacity found in garlic and other members of this family. Handling Fresh Ramps/Wild Leeks A papery wrapper leaf (and some dirt) may surround the bulb and should be pulled off as you would with scallions. Trim away any roots along with their little button attachment. The entire plant is now ready for eating. 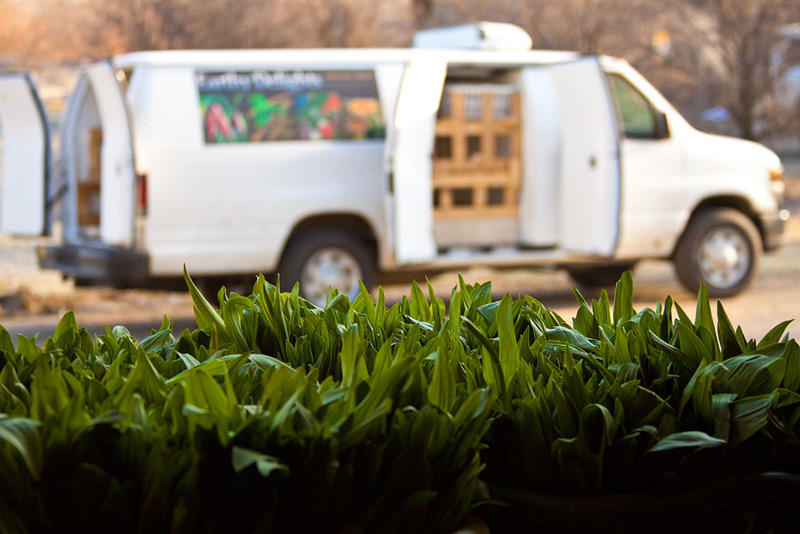 Once ramps / wild leeks have been cleaned, store them in the refrigerator tightly wrapped to keep them from drying out (and to protect the rest of the contents of the fridge from the heady aroma). They should keep for a week or more, but use them as soon as possible after harvest. There are literally hundreds of ways to cook ramps and many recipes are easily adapted to accommodate the powerful flavor and aroma of this wild member of the onion family. These days, hardly any chef worth his or her salt will miss the opportunity to show off his “ramp prowess” during the all-too-short season. And lest their stinky reputation scare you away from trying them, you should know that Earthy Delights sells ramps and wild leeks (both) to some of the finest restaurants in America. Pingback: Leelanau.com | Wild Leeks in Leelanau!